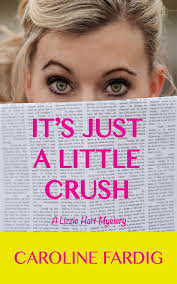 It's Just a Little Crush by Caroline Fardig is a "Lizzie Hart Mystery". This book was released in January 2013. This is a Sarka Jonae publication. This book is 270 pages in length. The small town of Liberty is hardly a crime mecca. But, when a young woman is murdered, it turns out the town is full of secrets and sins. Lizzie Hart works for the town newspaper as a copy editor. She has a HUGE crush on Blake Morgan, a reporter for the paper. When the paper begins reporting on the murder, Lizzie is determined to find out as much as the hotshot reporter she has a crush on. But, the unexpected takes place when another death occurs and Lizzie begins to suspect Blake. Her sleuthing has gotten under someone's skin, but the question is, whose? Lizzie Hart is a regular girl, with a regular job. She seems to have some committment issues when it comes to men. Her attraction to Blake is purely physcial in the beginning. But, then she can't decide what his game is. Is he a murderer, a womanizer, a friend, or something more? This mystery/romance was pure entertainment. I love Lizzie. She was like someone you might know in real life. The goings on in a small town didn't seem overly contrived. Who knows what goes on behind closed doors? The mystery was solid. There was no graphic violence or indepth forensics that might bother some people. The tone was light and laced with wit and humor. There was no explicit sexual content, mostly just innuendo. I think this book would appeal to mystery lovers, romance lovers, and maybe even those that like cozies, and chick lit. I am really looking forward to the next book in the series. This one really shows promise. Well done! This one gets a solid A.